'The Camino Voyage' tracks an eclectic bunch of Irishmen, including a writer, two musicians, an artist and a stonemason, making an ambitious 2500km journey from Ireland to the Camino by boat. The crew is led by Danny Sheehy (also known as Domhnall Mac Síthigh), a well-known Gaeilgeóir writer and poet. He’s also an experienced seaman, having previously circumnavigated Ireland in a traditional naomhóg, or Kerry currach, and rowed to Iona in Scotland to deliver an Irish-language bible on the feast day of St. Colmcille in 2012. 'The Camino Voyage' features his crew as they follow in the footsteps – or oar-strokes – of their ancestors and row to A Coruña in Spain, the traditional starting point for Irish pilgrims walking the Camino de Santiago. They undertake this journey over the course of three summers in another naomhóg, the ‘Naomh Gobnait’ camping in various coastal towns and beaches en-route each night. It's clear from the outset that this voyage is a passion project for all involved. The men make meditative comparisons between their journey and ancient pilgrimages with reverent, religious fervour. The film’s vibrant soundtrack also underscores the connection to the past, the near-mythological sense of pilgrimage, and it generally keeps the film afloat. Even Sheehy’s discussion of the naomhóg itself, how it is made, and scenes of the crew good-naturedly maintaining the vessel, reveal how meaningful this undertaking is for all involved. Their dedication to the voyage, undertaken over the course of three years, is oar-inspiring – and once can understand why this seems like a compelling idea for a documentary. Unfortunately, this passion doesn't always translate into an enthralling viewing experience. While there are some beautiful early-morning coastal shots, and scenes of free-flowing, spontaneous musicianship, the pacing stalls, at times, to a dead calm. The lack of conflict and peril is not necessarily a dealbreaker, but it does mean the film kind of washes over you without ever sweeping you off your feet. 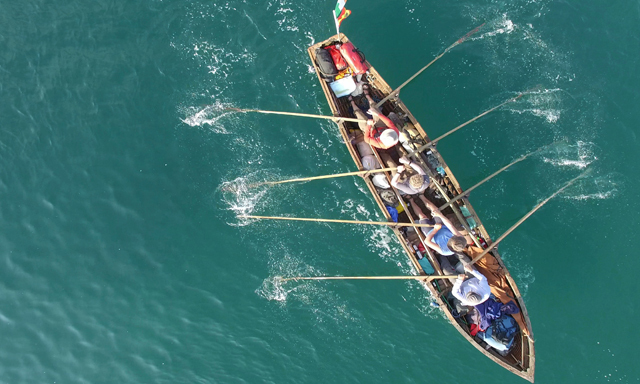 The documentary style is unassuming and non-intrusive, juxtaposing talking-head interviews with the crew on the Naomhóg (and their families) with casual observational shots of them rowing, resting, and meeting the locals at each new location. While this makes for a naturalistic realism, in line with the humbling nature of the task at hand, its low-key nature does have the effect of muting or downplaying the scale of what the men are actually doing. The crew's geographical progress is tracked by on-screen graphics – travelling by map, a la 'The Muppets' – but their epic 2500km voyage is somewhat reduced to a handful of shots of different pubs, shoreside campsites, and Glen Hansard singing sea shanties. This is especially jarring given the rather abrupt and tragic ending to the film, an emotional epilogue which puts the completed journey in perspective, and highlights the potential risks of such a voyage. 'The Camino Voyage' is a chronicle of a grand and noble journey, which ultimately serves as a poignant memorial. Thoughtful, poetic and meditative, it makes ripples rather than waves, but maybe that’s what floats your boat.